Who goes to Minnesota in January? 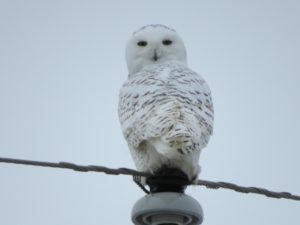 If you want to see Great Gray and Snowy Owls then traveling to the Sax Zim Bog just outside Duluth, Minnesota is a must. 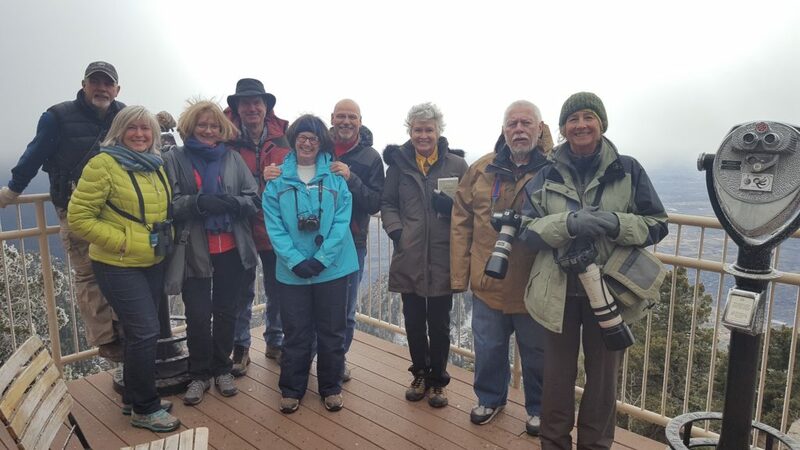 Front Range Birding helped, along with Sheridan Samano of the Reefs to Rockies travel company, to lead a small group of intrepid birders to this cold north location to see these and other great boreal birds. 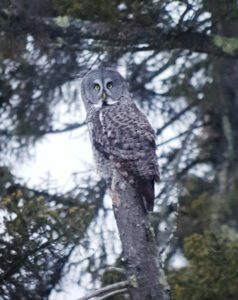 Top left and top center – Great Grey Owl! 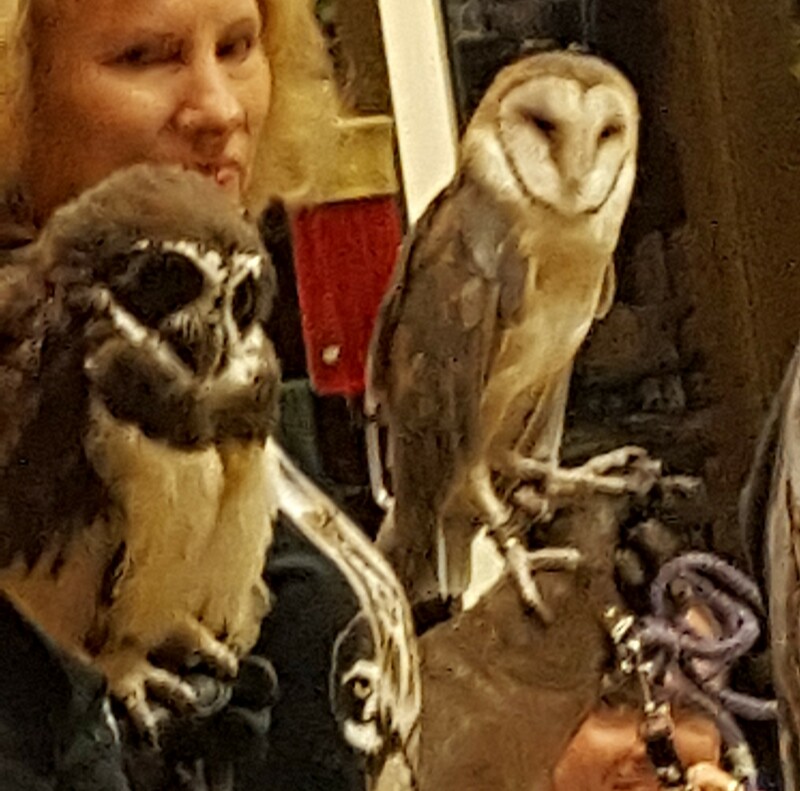 Top right – Snowy Owl! Score!! Bottom left – The drive into Sax Zim Bog Bottom right – Our group from Colorado, Delaware, and New Jersey. Considering the weather, and dead of winter time frame, the number of birds seen was quite impressive. Most in the group picked up multiple life birds for their lists. The temps were very tolerable and brought out many of the Minnesota winter residents. Aside from our target birds pictured above, of note were the Black-backed woodpecker, White-winged crossbill, Bohemian waxwing, Pileated woodpecker, Boreal chickadee, and Golden-crowned sparrow. We loved our stay in Duluth, Minnesota at the historic Fitger’s Inn which is located in the vintage 1885 renovated Fitger’s Brewery. The shores of Lake Superior offered great views and ambiance and all of us had a fantastic time. Thank you Reef to Rockies for setting up this trip! Our complete list of birds seen is below. Our partnership with Reefs to Rockies is great and we are planning many more trips with them. Next up is a visit to the Sandhill Crane Capital of the World – Kearney, Nebraska March 25-27, 2017. Be sure to visit Reefs to Rockies website for details on this trip. Also sign up for our newsletter on this website to learn more about this and other great trips with Front Range Birding! Well, Saturday was another great day of birding. Eleven of us went to South Platte Park, where the winds calmed down and the temperature warmed up quite nicely. 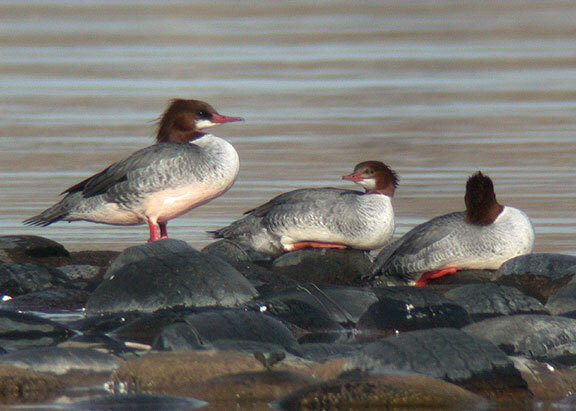 We started by looking at the orange legs of female Common Mergansers. 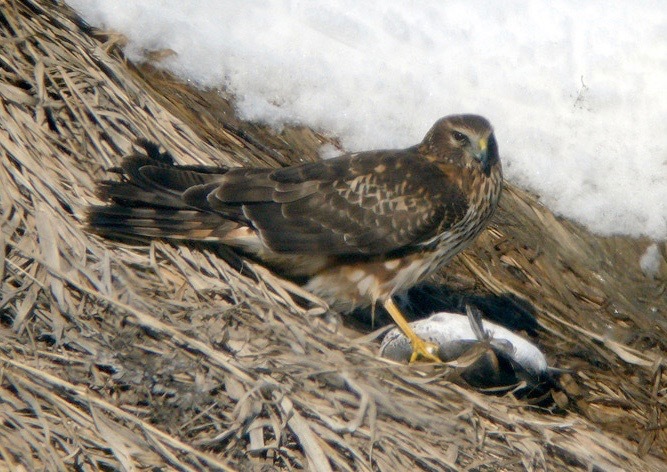 Our first enthralling bird of the day was a female Northern Harrier, which flew down from a nearby tree with prey in its talons, and landed out in the open on the edge of Blackrock Lake. We were able to watch her for some time as she ate her breakfast – possibly a pigeon or a coot. The photos below are not of our bird, but they give you an idea of what we saw. Note the owl-like facial disc, the white both above and below the eye, the streaking on the upper breast and nape, the long banded tail, the white rump, AND the prey (in this case a Green-winged Teal). Then, we were most fortunate to see my target bird for the day, Greater Scaup, which are uncommon wintering bird in the interior of the continent, preferring salt water along both coasts. However, they have been occurring regularly at Blackrock Lake over the past three winters, and we were able to see eight of them. Distinguishing Greater Scaup from Lesser Scaup, which occur regularly here in the winter, is one of the trickier IDs, and I hope our group didn’t tire of my trying to point out some of the distinguishing characteristics. Among these, head-shape is a key factor. In the photos below note how the three Greater Scaup have more rounded, longer heads, with eyes closer to the top of their heads. 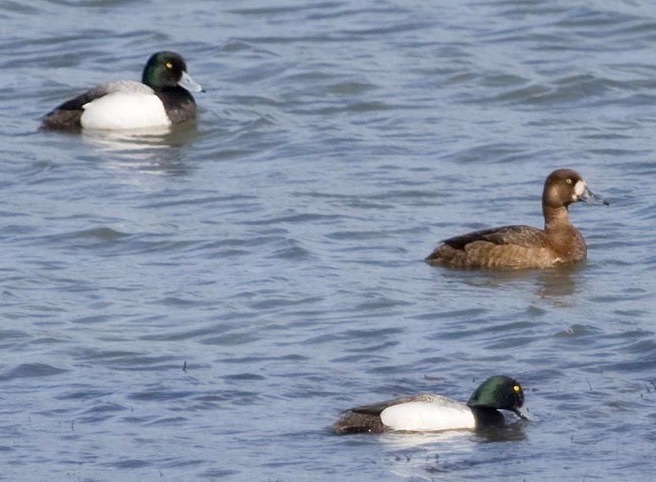 The single Lesser Scaup, on the other hand, has a more pointy head with an obvious corner towards the rear of the head, and the eye appears to not be as close to the top of the head. I have spent hours working on the finer points of distinguishing these two species, and you can too if you get on over to Blackrock Lake. Apparently the Greater Scaup are showing up there again with some regularity. 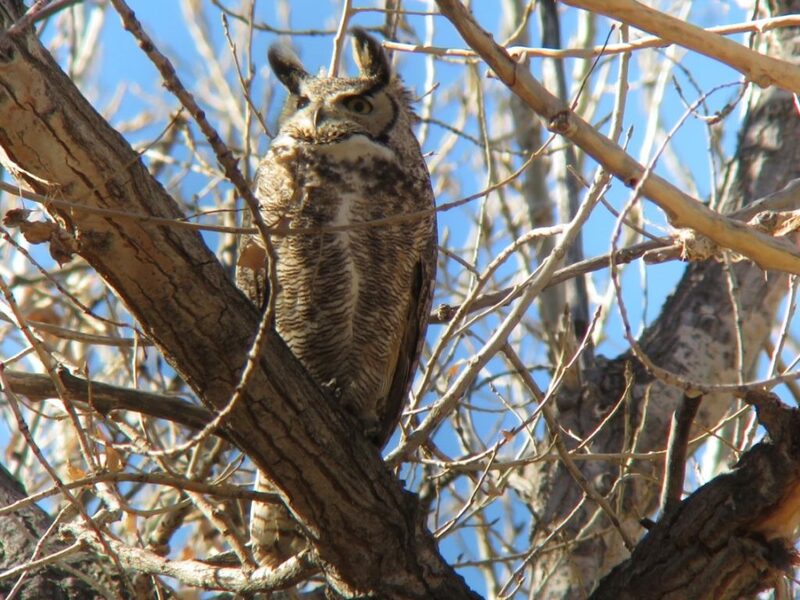 One additional highlight of the day is that were able to locate a pair of Great Horned Owls. Their proximity to a huge nest high in a cottonwood may indicate that they have chosen their nesting site for this year. The female could be incubating eggs anytime now, as here in Colorado nests tend to begin being occupied at the beginning of February. Incubation then lasts about 35 days, so we could expect to start seeing little white owlets as early as mid-March. However, there is great variation in the nesting phenology, and it is possible to see owlets in nests as late as July. The photo below is of the male we saw. Hope you guys are enjoying these mild days, and enjoying the wintering ducks. Saturday was another great day of birding! Eleven of us went to South Platte Park, where the winds calmed down and the temperature warmed up quite nicely. We began by noting the orange legs on the female Common Mergansers. 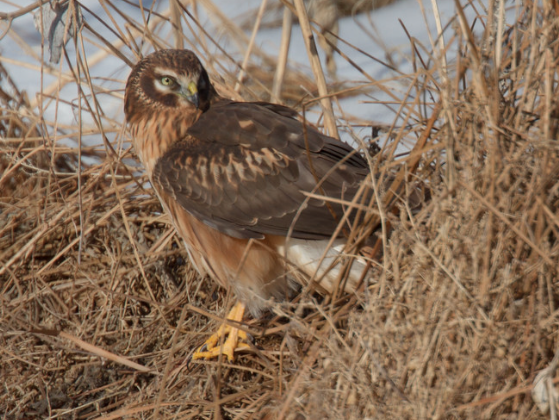 Our first really enthralling bird of the day was a female Northern Harrier, which flew down from a nearby tree with prey in its talons, and landed out in the open on the edge of Blackrock Lake. We were able to watch her for some time as she ate her breakfast – possibly a pigeon or a coot. 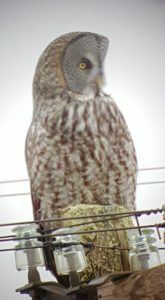 The photos below are not of our bird, but they give you an idea of what we saw. Note the owl-like facial disc, the white both above and below the eye, the streaking on the upper breast and nape, the long banded tail, the white rump, AND the prey (in this case a Green-winged Teal). Then, we were most fortunate to see my target bird for the day, Greater Scaup, which are an uncommon wintering bird in the interior of the continent, preferring salt water along both coasts. However, they have been occurring regularly at Blackrock Lake over the past three winters, and we were able to see eight of them. Distinguishing Greater Scaup from Lesser Scaup, which occur regularly here in the winter, is one of the trickier IDs, and I hope our group didn’t tire of my trying to point out some of the distinguishing characteristics. Among these, head-shape is a key factor. In the photos below note how the three Greater Scaup have more rounded, longer heads, with eyes closer to the top of their heads. 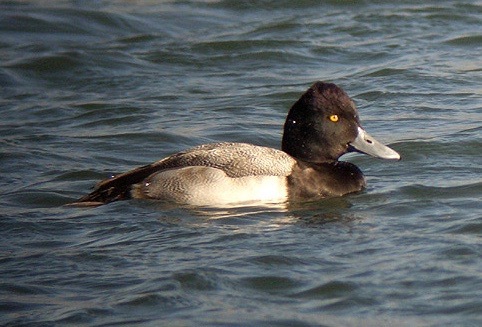 The single Lesser Scaup, on the other hand, has a more pointy head with an obvious corner towards the rear of the head, and the eye appears to not be as close to the top of the head. I have spent hours working on the finer points of distinguishing these two species, and you can too, if you get on over to Blackrock Lake. Apparently the Greater Scaup are showing up there again with some regularity. One additional highlight of the day was that we were able to locate a pair of Great Horned Owls. Their proximity to a huge nest high in a cottonwood may indicate that they have chosen their nesting site for this year. The female could be incubating eggs anytime now, as here in Colorado nests tend to begin being occupied at the beginning of February. Incubation then lasts about 35 days, so we could expect to start seeing little white owlets as early as mid-March. However, there is great variation in the nesting phenology, and it is possible to see owlets in nests as late as July. The photo below is of the male we saw. As you may remember, Saturday morning was wonderfully mild, and fifteen of us got to enjoy the weather as well as the good variety of ducks along the South Platte and in the adjacent ponds in the vicinity of Hudson Gardens. To begin with, we were early enough to catch a large number of Cackling and Canada Geese down on the river, and get the opportunity to compare relative sizes. This is a very tricky business, and frankly much of it is beyond me. There are eleven subspecies of Canada Goose, and four subspecies of Cackling Goose, all of which have a superficial resemblance to one another, and with some size overlap. However, generally speaking, Cacklers are a small, stocky goose with a thicker shorter neck, a steeper forehead, and a small, stubby bill. When there are Mallards present (which was the case on Saturday) one can see that the smallest subspecies of Cackling Goose (25”) is only slightly larger than a Mallard (23”). These are the Cackling Geese that I can identify with some degree of confidence. 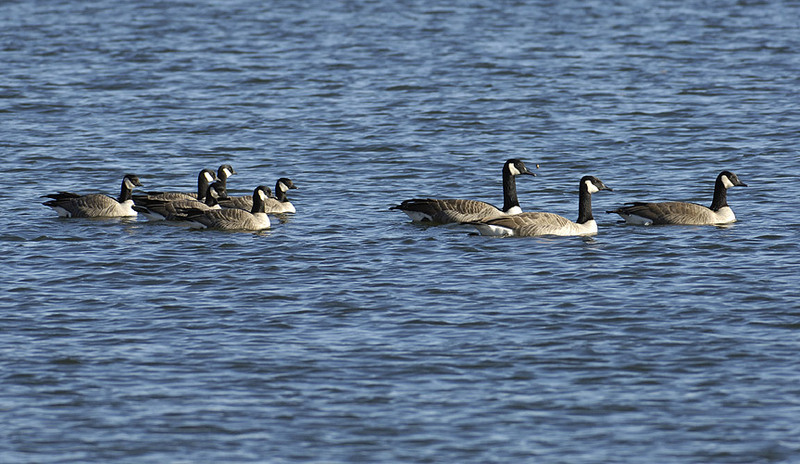 The photo below shows Cackling Geese on the left and Canada Geese on the right. We then proceeded to get GREAT looks at nine species of ducks. Highlights included a male Wood Duck, a pair of Ring-necked Ducks, several Buffleheads, a few Common Goldeneyes and a few Hooded Mergansers. The real highlight of the day was a male Barrow’s Goldeneye. 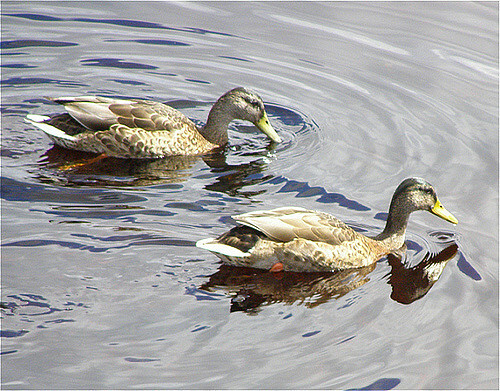 These ducks breed largely west of the Continental Divide up in the Canadian Rockies. They then winter as far south as northern California and western Colorado. We see a few each winter east of the Divide, but it is a rare occurrence, and always a special one. We ended the morning having seen 26 species (see list below). Hope to see you soon at the store, or on another walk! A great treat on the 2nd day of the trip was the dawn “Fly Out” of thousands of Sandhill Cranes, Ross’s Geese and Snow Geese. Perhaps the most enjoyable part of the trip was the Sunday Rosy-Finch banding experience at Sandia Crest House overlooking Albuquerque, NM. 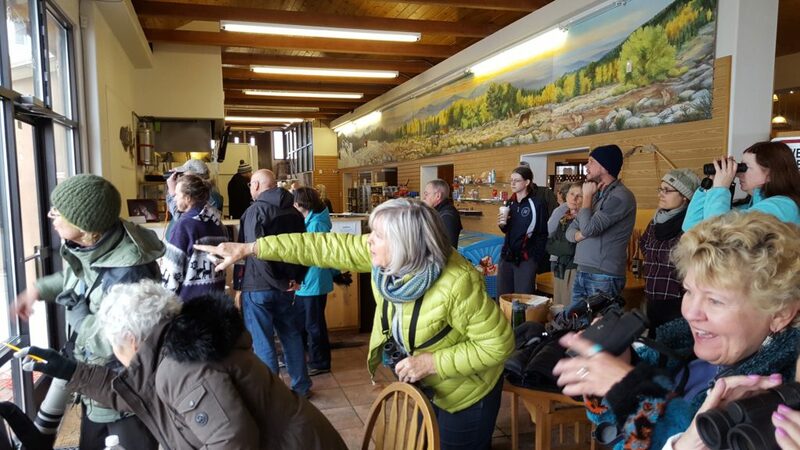 Our group at the Sandia Crest House watching rosy-finch banding. Everyone had a great time! 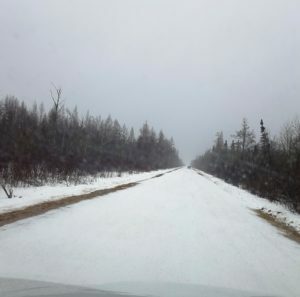 This month, we are heading to Minnesota with a group to see the boreal winter birds at Sax Zim Bog outside of Duluth. Be sure to watch for more of our adventures as we partner with the good folks at Reefs to Rockies tour company. It was a bit nippy on Saturday morning as fifteen of us began surveying for birds at South Platte Park. Fortunately, the wind wasn’t blowing, the sun eventually made itself known, and by late morning it was gorgeous out. As for the birds, we tallied 39 species (see list below), and found ourselves pretty continuously occupied working on our identifications. Among the highlights were the Hooded Mergansers that seemed to be everywhere with the males often raising their spectacular crests. We were also lucky to see three Wood Ducks sitting atop a large midstream boulder in the South Platte. The rare finding for the morning was a single Ruby-crowned Kinglet hanging out with some Black-capped Chickadees. We were fortunate in seeing three species of sparrows: American Tree Sparrow, White-crowned Sparrow, and Song Sparrow (photos courtesy of Bill Schmoker). The White-crowned Sparrow photo is of a juvenile as we tend to see far more of them this time of year. And we were additionally fortunate in seeing four species of raptors: Sharp-shinned Hawk, Bald Eagle, Red-tailed Hawk, and American Kestrel. Overall, we didn’t see anything unexpected, but we were fortunate in seeing the diversity of the regularly occurring winter species that we did. Birds I had hoped for that we did not see were Long-tailed Duck and Greater Scaup. We also missed on a few of the more common species such as Common Merganser, Great-horned Owl, Blue Jay, and Dark-eyed Junco. Well, it was another beautiful morning at Hudson Gardens, and nine of us were there to take it all in. While we only tallied 21 species (see list below) we had good activity and a number of entertaining moments. Only a few male ducks exhibited any eclipse plumage, and for the most part they are looking pretty bright and beautiful and ready to go courting (in a few months). As you guys know, Mallards are here year round. So are Northern Shovelers, Gadwall, and Hooded Mergansers, thoiugh in relatively low numbers, and now is when those numbers start to go up due to migration and the fact that this is a popular wintering area for these species. Several of the diving ducks are only found here during the winter, and our single female Bufflehead (see photo) is a harbinger of more divers showing up soon, e.g. Canvasback, Greater Scaup, Common Goldeneye, and Red-breasted Merganser. One more ducky note. When the first Colorado Breeding Bird Atlas came out in 1998 there were only two accepted breeding records for Hooded Merganser for the entire state. Since then, a few more records have emerged, but this is an interesting species to keep an eye out for this coming breeding season. One interesting note from our walk is that we encountered a large flock of Red-winged Blackbirds that, as near as we could tell, consisted exclusively of male birds. We know that in the spring males arrive before females to begin setting up territories. Apparently, males return south in the fall after the females have already left. 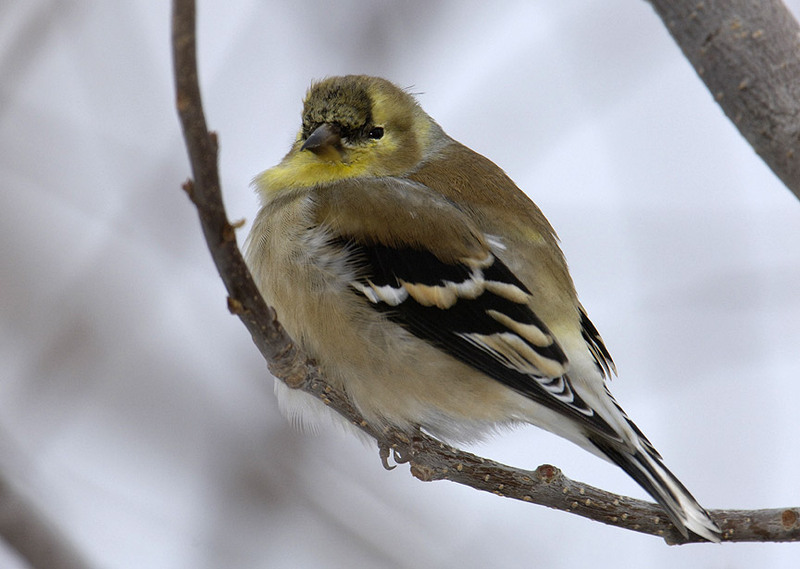 One other highlight was getting really good looks at a variety of American Goldfinches in their winter plumage. Just over a week ago we had a great time with our customers! 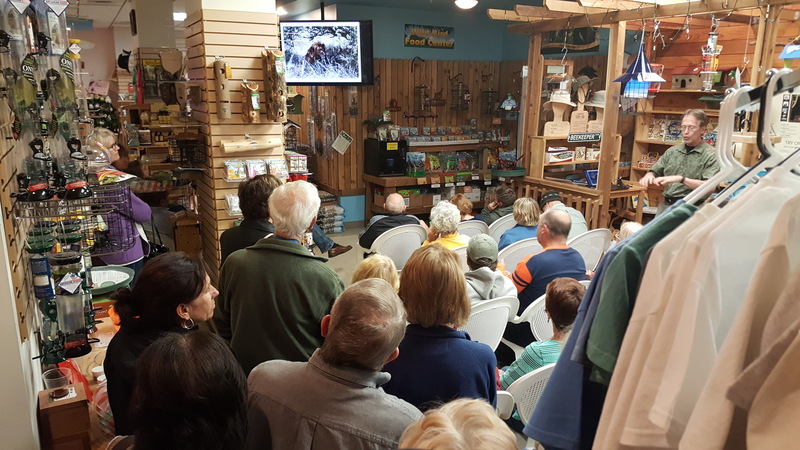 Bill Eden gave a fantastic presentation showing his Tanzania photo safari. Also HawkQuest! 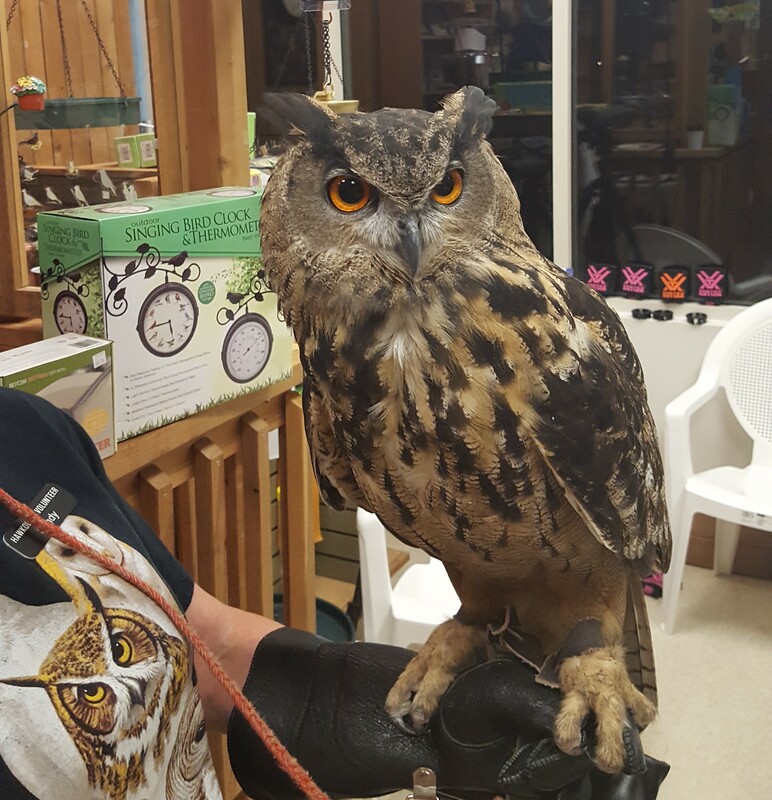 brought in 4 live owls of the world, Zeiss supplied a great pair of binoculars for a door prize. All that along with burgers, brats, beans, and beer from our bbq on the back porch. 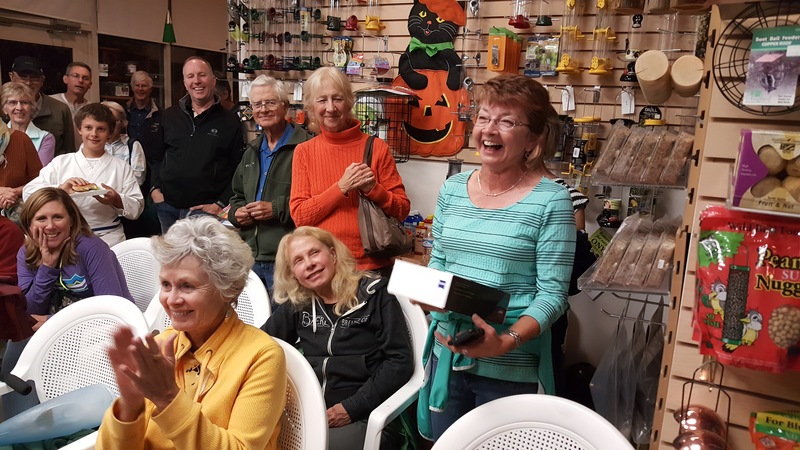 Kathy Neely wins a pair of Zeiss 8×32 Terra ED binoculars! Bill Eden (below right) gives presentation on Tanzania. Be sure that you are on our email list to learn about all of our events! Tagawa Gardens, a beautiful and extensive garden center, is adjacent to a series of open space properties along Cherry Creek just upstream from Cherry Creek State Park, and on Saturday thirteen of us explored some of the immediate environs to see what birds we could find. The good part of all this was that we had a great group of participants and the weather was glorious. However, as one person noted, “The birds didn’t get the memo.” There were few to be seen, and we tallied only 16 species (see list below). We noted that the male Mallards are largely done with the eclipse phase of their molting, and we saw only one that was still a bit mottled looking. The others were wonderful with their new breeding plumage that they will now carry through the winter. Just a reminder that when in eclipse plumage bill color is perhaps the easiest way to tell a male from a female. Note the solid yellowish bill of the males, while the female’s bill is orange with a splotch of black on top. All photos are courtesy of Bill Schmoker. We also had great looks at a pair of adult, light-morph, Red-tailed Hawks. Note the all-dark head, the lightly streaked belly-band, the dark leading-edge of the wing (this is diagnostic), and the “bulging secondaries” (this is where the trailing edge of the wing gets a bit wider). Oh, yeah, it also has a “red” tail, telling us this is an adult – juvenile tails are finely banded without the red. There was a very cooperative female Downy Woodpecker. Note how the length of the bill is much shorter than the width of the head, there’s a conspicuous white tuft right behind the bill, and there are little black bars on the outer tail feathers. Finally, we saw a few beautiful Western Meadowlarks. Remember to have your bird feeders ready to go for feeding the birds this winter, and, that when you’re ready, the Front Range Birding Company will give you the best prices when it comes to optics! Well, it seems as though a major part of fall migration has been completed for many species. Twelve of us covered a lot of ground at the Wheat Ridge Greenbelt this past Saturday, but we were only able to come up with 27 species (see list below). Absent from the area were Double-crested Cormorant, Snowy Egret, Black-crowned Night-Heron, Cinnamon Teal, Spotted Sandpiper, Hummingbirds, Flycatchers, Swallows….. Well, you get the idea. These are species that have largely moved on south. Of course, another aspect of fall migration is those birds that bred farther north, and that will retreat south to spend the winter here in Colorado. Many of these species just haven’t arrived yet in any numbers, but we can still be on the lookout for them, e.g. 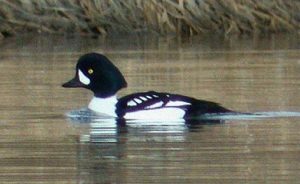 Common Goldeneye, Bufflehead, Red-breasted Merganser, Rough-legged Hawk, Merlin, American Tree Sparrow, and the winter Juncos. In the meantime we’ve got a bit of a hiatus, and this mild fall weather is keeping things a bit quieter for a while. So what were Saturday’s highlights? We had a few Gadwall – these are early arrivals that will spend the winter here (photo courtesy of Bill Schmoker). We had only one Robin, the majority seem to have moved on out. Perhaps the most interesting observation was of a begging Lesser Goldfinch, meaning that a pair are raising fledglings pretty late in the year. So, 27 species isn’t like we got skunked, but we will hope for a bit better action on our upcoming walks.